The United States has for decades enjoyed pre-eminent military stature, due in large part to the overwhelming technological advantages since World War II. We have been able to maintain peaceful international commerce as well as act militarily on a global scale. However, to an unacceptable degree, the United States has not prioritized maintaining technological advantage over near peer competitors and even rogue states. Due to investments by our adversaries in many of the same key technologies, they are becoming increasingly able to challenge U.S. military pre-eminence. Short of directly challenging military pre-eminence, some adversaries’ ability to hold at risk the homeland and key systems constrain our options in response to aggression. The current threat trends promise that this challenge will only increase, further constraining the options of U.S. leaders. This includes options that we have grown to take for granted. Choices to act in space, aerospace, surface, and sub-surface will be deterred by our inability to meet contemporary and future threats. Limiting U.S. leaders’ options, particularly strategic options, could be especially devastating in a crisis. In particular, several adversaries have prioritized the development of missile forces to hold at risk the U.S. homeland, allies, deployed forces, and space assets. Russia and China have long held the ability to hold the U.S. homeland and other key target areas at risk, and continue to devote significant resources to increasingly complex missile systems including anti-ship missiles, hypersonic glide vehicles, and direct-ascent anti-satellite missiles. Even North Korea and Iran, countries once deemed capable of building only “limited” missile capabilities, are achieving greater ranges, mobility, increased accuracy, and have the technical ability to use more challenging counter-measures, all while amassing great numbers of missiles to enable salvo launches. The threat posed by direct-ascent anti-satellite missiles is especially grave. By holding at risk U.S. space systems, adversaries threaten that which gives the United States much of its military superiority. As aptly stated by the National Security Space Strategy, when combined with other capabilities, space systems allow joint forces to see the battlefield with clarity, navigate with accuracy, strike with precision, communicate with certainty, and operate with assurance.1 For many years such space systems were both beyond the capability and reach of any potential U.S. adversary. In recent years, recognizing the asymmetric nature of U.S. space dominance together with space assets’ fragility and vulnerability to attack, our adversaries have taken advantage of this U.S. Achilles’ heel by developing weapons to target space assets. While it is true adversaries are developing various types of methods to disrupt or destroy space assets, including co-orbital anti-satellite weapons (ASATs), the scope of this study is limited to the threat to space systems posed by direct-ascent anti-satellite missiles, as these systems are the first to have been demonstrated in actual flight tests. China has demonstrated an operational direct-ascent anti-satellite missile capability, and has proven that it can reach from low earth orbit to geosynchronous altitudes2 putting nearly the full spectrum of our defense and intelligence satellites at risk. Not only does this give China a powerful coercive ability, it also creates the temptation to eliminate in a pre-emptive strike the warfighting assets upon which the United States is most reliant. Although China is the most advanced in this regard, other spacefaring adversaries are increasingly able to hold U.S. space assets at risk. Russia has a formative space weapons program and media reports indicate it has tested a direct-ascent anti-satellite missile. North Korea and Iran have each launched satellites into orbit. These developments clearly show the sanctuary status once assumed for U.S. space assets has been irredeemably lost, and, whether we wish it or not, powerfully demonstrates that the space domain is a battlefield. Our current space defense posture is primarily passive and reactive, an anachronism of the Cold War era during which we had a single superpower adversary and the uneasy deterrence construct relying on Mutual Assured Destruction. Acknowledging its vulnerability in space, the United States has begun to build resiliency into its space architectures, and military leaders are advocating to Congress for the funds necessary to improve space situational awareness (SSA). Both resiliency and a robust SSA capability are critical to a successful U.S. national security space strategy, but are not by themselves enough. The United States cannot prevail in space merely by passively defending itself against hostile force; it must have active defences as well. Although there is a place for deeply classified programs and activity toward this end, any credible deterrence strategy is dependent upon the United States making clear to our adversaries the high value the United States assigns to its space assets and that we possess the capability and willingness to defend those assets. Implementing a credible modern deterrence strategy that removes ambiguity concerning the consequences of an attack on U.S. space assets, while fully integrating our space layer to respond to threats across all domains, is the best course for ensuring a secure space environment. To be sure, it is a necessary condition for ensuring and safeguarding future U.S. military pre-eminence. A critical component of a strengthened and modernized strategic posture that better integrates the space domain is a robust, layered, missile defense system that provides protection of the United States and that which it values most. The current U.S. ballistic missile defense system (BMDS) is composed of land- and sea-based interceptors, cued by sensors on land, at sea, and in space. There is no interceptor layer located in space. While each present-day element of the BMDS plays a significant role in the defense of the U.S. homeland, allies, and deployed forces, the system is designed to handle only limited threats posed by rogue nations. It is not designed to handle the more complex missile threats from near-peer adversaries such as Russia and China. Additionally, the pace at which rogue nations such as North Korea and Iran are improving both the quality and quantity of their own missiles, poses significant challenges for the present system. This study recommends augmenting the U.S. strategic posture by enabling the use of space for the defense of the United States across military domains; specifically, the United States should immediately begin the necessary steps to deploy a space-based interceptor (SBI) capability. An SBI capability would dramatically augment U.S. terrestrially- and sea-based defensive capabilities, reduce the demands upon current systems, and provide the United States with the optimal vantage point for destroying enemy missiles regardless of their launch or target location, whether on land, at sea, in the air, or in space. A critical benefit of an SBI layer is the ability to destroy many missiles during their boost phase, while the missile is still over enemy territory and before the enemy can deploy their nuclear warheads, counter-measures, and decoys. Opponents of SBI offer numerous arguments against deploying the capability, but those arguments are predicated on false assumptions. For example, opponents have argued that deploying SBI would instigate an arms race with countries like Russia and China. But American military strength has not provoked adversaries’ investments in military capabilities; rather, U.S. capability gaps have prompted our adversaries to invest in weapons to exploit U.S. vulnerabilities. The task at hand is to close those gaps in order to deter adversaries’ continued investments. Opponents have also insisted that a kinetic interceptor capability in space remains technically out of reach and is cost prohibitive. However, available technology makes it entirely feasible and affordable in the near term. Others have said that deploying SBI is prohibited by an international treaty and threatens to create devastating permanent space debris, but there is no treaty that prohibits SBI, and the risks from debris are manageable. For example, an enemy missile destroyed in boost phase cannot produce long-lived orbital debris. We have long since passed the threshold of concern that space will one day become the next battlefield, and we are at a pivotal moment. The United States of America will not maintain its pre-eminent global power status by default nor absent further action. We must choose this path, and if chosen, we must better utilize the space domain to nullify any adversary’s ability to coerce and blackmail the United States with missiles, possibly armed with nuclear weapons. Although missile defense is only one component of the U.S. strategic posture, by optimally defending what the United States values—the entire U.S. homeland, allies, deployed forces, and assets located in space—the BMDS, with SBI, would serve as a powerful deterrent and a critical means of defense should deterrence fail. U.S. adversaries are investing in missile technologies to contest U.S. military pre-eminence and challenge U.S. technical superiority. Adversaries’ ability to hold at risk the homeland and key systems, such as space based systems, will constrain in unacceptable ways our decision-making ability and options in the future. U.S. vulnerabilities to missile attack have not deterred adversaries from investing in the development of offensive weapons, but have instead prompted adversaries to exploit those vulnerabilities. Due to the vulnerability of, and the U.S. reliance on, space assets, adversaries have sought to target those assets with a variety of weapons including direct-ascent anti-satellite missiles. A space-based interceptor (SBI) capability is essential to augment U.S. terrestrially and sea-based capabilities, and keep pace with the threats we face. 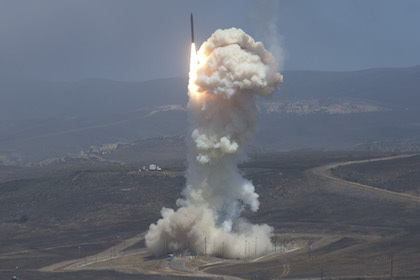 An SBI capability would enable the United States to better defend against the missile threats to the U.S. homeland, allies, deployed forces, and critical space assets. No treaty or international conventions or norms prohibits the deployment of an SBI capability. Modern technologies can be leveraged to develop an effective SBI capability in the near term and at a reasonable cost. The risk of debris posed by an SBI capability is manageable, and in most cases negligible. Reform the informal missile defense policy of the United States from one that is limited to one that is robust. For the sake of clarity this will likely require the amending of the 1999 National Missile Defense Act. Continue investments to sustain and modernize current, operational missile defense systems including Aegis, Terminal High Altitude Area Defense (THAAD), and Ground-based Midcourse Defense (GMD), among others, to improve reliability. Investments in a space layer should not come at the expense of necessary sustainment of currently operational systems. Given the growing spectrum of missile threats, the United States must fully integrate and use the space domain to defend access to space, assets in space, as well as the U.S. homeland, allies, and deployed forces. Deploy as soon as possible an SBI capability to provide a robust defense of what the United States values most: The U.S. homeland, space assets, deployed forces, and allies. Ideally, this constellation of satellites with an SBI capability would also be equipped with an SSA capability. 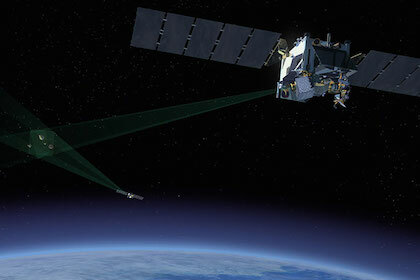 Continue investments in directed energy technology to one-day aid or replace space-based kinetic interceptors. U.S. leaders must make the strategic decision to adapt our space posture and missile defense strategy to optimally defend against present and foreseeable missile threats. The failure to leverage modern technologies that would exponentially improve our security in this way is to choose to remain under-defended, and in some instances, undefended. Remaining vulnerable to current missile threats is to knowingly place the security of Americans and the United States’ military pre-eminence at the mercy of countries like China, Russia, North Korea, and Iran. This is highly unstable, and because it is technically avoidable, wholly unacceptable. We cannot afford to wait until a crisis is upon us before we are spurred to action. Now is the time to act. This Hudson Institute study on space and the right to self-defense draws upon the invaluable knowledge and experience of a distinguished Senior Review Group. While the members of the group have found consensus on the study’s contents herein, there may be precise wording or areas of emphasis on which there is some disagreement. This study does not necessarily reflect the positions of their current affiliations or that of the U.S. government. We have entered a new missile era. In calendar year 2015 there were over 300 missile launches and more than 60 foreign space launches.3 The reasons for the immense investment in missiles are clear. Many countries view their missile forces as a symbol of national strength. Missiles present an asymmetric threat to U.S. airpower, can penetrate enemy territory, and reach their target in a very short timeframe. For many countries, missiles are a cost-effective means to threaten and coerce adversaries with superior militaries. This is true even with conventionally armed missiles. But if the missile is armed with a weapon of mass destruction, especially a nuclear one, even limited use of these weapons could be devastating. Therefore, missiles offer nations the ability to wield a particularly powerful coercive capability, regardless of their accuracy. For Iran and North Korea, for example, the mere existence of missile programs serves as a deterrent—not in the classical sense of deterrence, but rather to deter U.S. responses to their aggression in the region. Importantly, and yet often underappreciated, space launch programs and long-range missile programs can be viewed as one and the same since the technology for a space launch is directly applicable to a missile launch (with the important distinction that it does not test a reentry vehicle).4 North Korea and Iran appear to have assessed that testing missiles as space launch vehicles (SLVs) can advance their military programs without risking the economic and political punishment that would result from an actual end-to-end long-range missile test. U.S. military leaders understand that the probability an adversary would employ a missile with a weapon of mass destruction against U.S. forces or interests, is likely higher today than in the past, even compared to the Cold War era.5 Consequently, military leaders must consider adversaries’ missile programs and therefore their options in response to aggression are limited. Iran possesses the largest and most diverse missile force in the Middle East and it is controlled by its Revolutionary Guard, which reports directly to the Supreme Leader. Iran is committed to achieving an intercontinental ballistic missile (ICBM) capability, despite international pressure to stop advancing its program, and likely is not far from achieving this capability. In defiance of United Nations Security Council Resolutions (UNSCRs), Iran’s leaders have recently committed to ramping up the number of tests. Iran uses its space-launch program as a primary means to improve its ICBM program. Since 2008, Iran has conducted four successful space launches. In addition to its long-range missile program, Iran is developing anti-ship ballistic missiles (ASBMs). Its medium-range ballistic missiles are capable of striking U.S. deployed forces, allies, and partners in the Middle East and Eastern Europe.6 Iran is fielding increased numbers of mobile regional ballistic missiles and has claimed that it has incorporated anti-missile-defense tactics and capabilities into its ballistic missile forces. Although Obama administration officials said the United States would seek to curb Iran’s missile program as part of the Joint Comprehensive Plan of Action (JCPOA), known as the “Iran deal,” the Iranians refused to make this concession and the administration backed down from its demand. Contrast this to previous examples of former nuclear proliferators such as Libya, which was willing to forgo its longer range missile program as part of ending and repudiating its nuclear programs.7 A formidable missile program like that of Iran’s should be understood as a part and parcel of Iran’s nuclear program. North Korea has conducted four underground nuclear explosions, its most recent on January 6, 2016. A month later, on February 7, it successfully orbited a satellite for the second time. The February satellite launch demonstrated the ability to carry a payload approximately twice that of the previous launch,12 and possibly over a much greater distance. North Korea’s space program is like Iran’s in that it is a means to advance its long-range offensive missile program. The country has continued its space launch program in the face of international opposition and several prohibitive UNSCRs which underscores its commitment to increasing the reliability of its already formidable long-range missile program. North Korea also continues to develop the Taepo Dong-2, which could reach the continental United States if configured as an ICBM. Additionally, it continues work on the road-mobile KN-08, also called the Hwasong13. The regime displayed the KN-08 on six road-mobile transporter-erector launchers (TEL) during military parades in both 2012 and 2013. As affirmed in the latest Department of Defense report on North Korea’s military capabilities, if successfully designed and developed, the KN-08 could be capable of reaching much of the continental United States. While the report also noted that “Without flight tests, the KN-08’s current reliability as a weapon system would be low,”13 a 2013 intelligence report assessed that it is likely that North Korea has achieved the ability to deliver a nuclear weapon, even if the reliability of the nuclear ballistic missile would be low.14 In sum, there is enough evidence to assess that should North Korea decide to attack the United States with a nuclear missile, it is likely it could do so. Especially considering the erratic nature of the North Korean regime, the United States must continue to prepare to defend against this threat. The United States has for decades enjoyed pre-eminent military stature, due in large part to the overwhelming technological advantages since World War II. But due to investments by our adversaries in many of these same key technologies, they are becoming increasingly able to challenge U.S. military pre-eminence. Specifically, near peer competitors are designing their missile forces explicitly to exploit capability gaps,16 and some countries’ capabilities are challenging U.S. superiority in key areas. All of these capabilities signal a concerted effort to increase the efficiency of first strike capacity and thereby gain strategic advantage for purposes of political coercion and escalation control. In recent years, senior Russian leaders also have made either explicit or implicit nuclear threats against U.S. allies. The Russian military has conducted an unprecedented number of nuclear war-gaming exercises against the United States and U.S. allies. Some of the war-gaming exercises have included flying nuclear-capable aircraft into NATO allies’ and Japanese airspace. The Rocket Force operates China’s land-based nuclear and conventional missiles. It is forming additional missile units, upgrading missile systems, and is developing methods to counter ballistic missile defenses.26 China has deployed more than 1,100 SRBMs across from Taiwan and is fielding cruise missiles, including the ground-launched CJ-10 land-attack cruise missile. China continues to field an anti-ship ballistic missile (ASBM), known as the DF-21D, which has a range exceeding 1,500 km, is armed with a maneuverable warhead, and is capable of attacking large ships, including aircraft carriers. 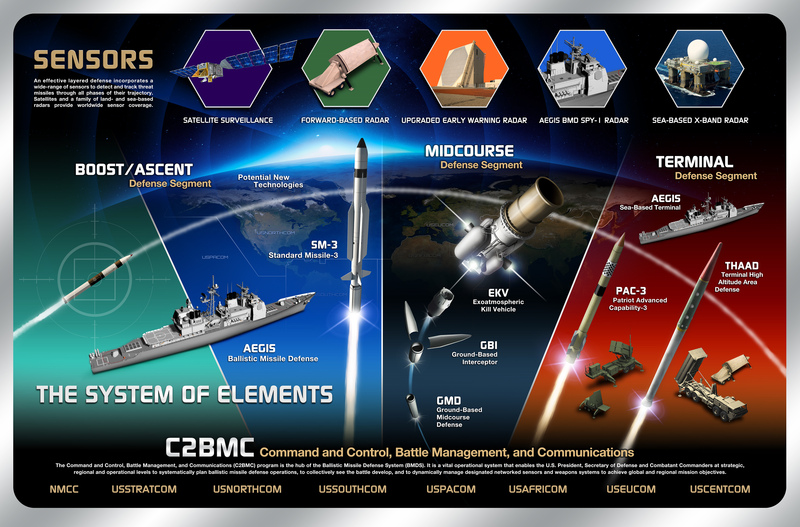 The current U.S. ballistic missile defense system (BMDS) is composed of interceptors based on land and at sea, and with sensors on land, at sea, and in space. Each element plays a significant and complementary role in creating a layered effect to protect the U.S. homeland, allies, and deployed forces from a range of ballistic missile threats. The Missile Defense Agency (MDA) follows the guidance found in the Missile Defense Act of 1999 (P.L. 106–38), which states that “It is the policy of the United States to deploy as soon as is technologically possible an effective National Missile Defense system capable of defending the territory of the United States against limited ballistic missile attack (whether accidental, unauthorized, or deliberate) …” Although the law as stated does not prohibit the development and deployment of a robust missile defense system to handle the spectrum of missile threats, policymakers in Congress as well as in the Executive Branch have chosen to build a limited system to defend against only rogue missile threats like those posed by North Korea and Iran. It is not designed to defend against the increasingly advanced and augmented arsenals of Russia and China. Notably, unlike when the Chinese destroyed a satellite and created thousands of pieces of debris, the United States intercepted the satellite at an altitude sufficient to ensure the intercept did not create long-term space debris. Although not yet close to an operational capability, the National laboratories and industry are developing electrically pumped laser technology in order to provide a boost phase defense capability from unmanned aerial vehicle (UAV) platforms. If it had sufficient political support, laser technology could also offer a significant improvement for the BMDS by dramatically increasing the shots available per target, thereby decreasing the cost. UAVs could be effective, but their use would be constrained due to geographic limitations and the air defense systems over theaters like those of Russia and China. It is advisable to continue investing in laser technology for a boost phase missile kill capability, especially if the technology could eventually be used from the space domain. In other words, the United States is under pressure to increase the effectiveness of its BMDS to outpace rogue missile threats while intentionally preventing its missile defense systems from becoming overly advanced so as to remain vulnerable to Russian and Chinese missiles, even as Russia and China pursue their own national missile defense capabilities41 and design their offensive missiles to exploit U.S. vulnerabilities. “strategic imbalance” that would prompt adversaries to invest in their offensive missile forces.42 In reality, the reverse has proven true. Adversaries invest in their missile forces because the United States remains vulnerable and committed to the policy of “limited” defense. Efforts to exploit U.S. vulnerabilities are most evident in the area of space. The United States is heavily reliant on space systems, and the ability to access space and protect its satellites from attack is non-optional. Military operations, military force projection, intelligence collection, weather forecasting, daily communication, banking systems, and financial markets all share a critical link—they depend on assets located in space. Indeed, the U.S. military has earned its superior status due to its unmatched global surveillance capabilities and its ability to anticipate future scenarios ranging from the weather, to early global and theater missile warning, to an adversary’s next move. There are currently more than a hundred U.S. military and intelligence satellites in orbit, providing critical national security capabilities to the United States.43 Even in some of the harshest environments far-removed from terrestrial communications networks, the United States has unmatched access and operational ability. In order to fully equip Strategic Command with this capability, the United States must change its unofficial missile defense policy from that of a limited mission scope and limited technical ability to one that is far more robust. Towards this end, the United States should deploy a space-based intercept (SBI) layer capable of boost- and ascent-phase intercept. An SBI capability would augment U.S. terrestrial and sea-based capabilities, and ease the tasks of current systems. A SBI capability would enable the United States to defend against missile threats to the U.S. homeland, allies and deployed forces, and address the direct-ascent anti-satellite threat, thus protecting our critical and unacceptably vulnerable space assets. Additionally, the sensor suite required to track and engage ballistic missiles could also make a significant contribution to SSA. To be clear, deploying an impenetrable missile shield should not be the objective, nor is it what is being recommended. SBI must be one component of a broader strategy to utilize space and missile defense technologies, with the overarching objective to close existing gaps and enable Strategic Command to optimally protect high value assets. An initial constellation of satellites with kinetic kill interceptors is feasible in the near term due to the technologies the United States already possesses. Beyond kinetic kill, the United States should support the development and testing of directed energy weapons systems and the associated engineering of such systems for space deployment. One of the great advantages of an SBI capability is that it provides the optimal location from which to launch a kinetic interceptor at an enemy missile in its boost phase. Boost phase occurs before a missile releases decoys and countermeasures meant to confuse and evade defensive systems and is, therefore, the ideal time to intercept. Critics have offered several objections to deploying an SBI capability, but these objections are predicated on false assumptions. For example, critics have long argued that a successful SBI boost-phase engagement would generate long-lived space debris. However, the challenges presented by debris are manageable. An SBI capability would have the ability to encounter the enemy missile in boost phase, either late in its boost phase, or in the immediate post-boost phase, before the bus has had time to dispense its warheads. As such, the enemy missile would not be more than a few hundred kilometers high at this point, nor more than a few hundred kilometers downrange from its launch site. Indeed, it may well still be over its own territory. Almost all of the debris would re-enter the Earth’s atmosphere immediately, some of it likely falling on the country which launched the attack. A small fraction of the collision debris would go into orbit, raising the concern about its potential hazard to the existing space infrastructure of our own and other peaceful nations; however, his hazard is both minimal and short-lived. It is minimal because almost none of the debris survives for a single full orbit. It is short-lived because the small fraction that does remain in orbit is at such a low altitude that upper-atmosphere drag will bring it back to Earth within hours, days, weeks, or at the very most, several months for a small number of pieces. The risk that a piece of debris will collide with another satellite during this time is quite low and is obviously a less serious risk in comparison with that of having a nuclear warhead land on our own or an allied nation. Last, opponents have argued that deploying SBI would instigate an arms race in space with countries like Russia and China. But the Russians and Chinese are already assiduously developing offensive anti-space weapons. American military strength has not provoked adversaries’ investments in military capabilities; rather, U.S. capability gaps have prompted our adversaries to invest in offensive weapons to exploit U.S. vulnerabilities in space. The task at hand is to close those gaps in order to protect our most valuable assets and to cause adversaries to doubt the effectiveness and value in attempting an attack against those space assets. This may also have the effect of deterring the enormous investments in those offensive capabilities. The modern threat environment is more diverse and complex than at any point in history. Near peer competitors and even rogue states are challenging U.S. technical superiority in key areas, and in doing so, U.S. military pre-eminence. Specifically, we have entered a missile era in which more nations and non-state entities possess missiles, improve them, and proliferate them. It is past time to invest in new technologies and to leverage current technologies to develop and deploy a robust missile defense system capable of defending the U.S. homeland, our allies, deployed forces, and space assets. Additionally, the United States must more fully integrate the space domain within the U.S. strategic posture in order to provide defense of U.S. assets across all domains. The United States has the resources and the technology to deploy a robust missile defense system, including space-based interceptors, but it will require changes to current policy and leveraging the modern technologies that would qualitatively improve our missile defense system. Failure to make this decision is to choose to remain under-defended, and in some instances, undefended. Remaining vulnerable to current missile threats is to knowingly place the security of all Americans at the mercy of countries like China and Russia. Considering the nature of the threat, and the availability of the technology to defend against it, to remain intentionally vulnerable is simply inexcusable. 31 In a Senate Armed Services Subcommittee on Strategic Forces hearing held on May 9, 2013, Lieutenant General Richard Formica (USA), Commander, U.S. Army Space and Missile Defense Command/Army Forces Strategic Command, Joint Functional Component Command for Integrated Missile Defense, had an exchange with Senator Angus King (I-Maine) about the threat posed by submarine-launch ballistic missiles. The exchange is included here, not the Commander’s admission that the United States does not have a strategy to deal with this threat. One of the issues that I’ve been concerned about as I’ve been in these hearings is that a growing submarine capability, it seems like everybody wants to have a submarine and other countries do. I take it that this shield that we are constructing and have constructed would be effective against a submarine launched missile which could be much closer. How do we deal with a submarine launched missile that would be a couple 100 miles offshore? Is that a different—is that a different issue? And again, it gets back to this East Coast issue. I can’t see how we could get a shield missile, an interceptor from Colorado or Alaska to protect the East Coast against a missile that’s launched from within 500 miles off the Coast. Talk to me about submarines. Actually, Senator, my assessment is that this ballistic missile defense system that’s in place is designed against an ICBM, an ICBM threat from North Korea and Iran. What is our strategy with regards to submarine launched missile?